the ones who are worthy of honor and praise. Honor and praise huh? Well who are they? O.K., now listen closely. There is one God. One God. That seems easy enough. What do you call this one God? Now wait just a minute. You told me that there is only one God. Which name do you use for this one God? The name I gave you. But you gave me three names. God the Father, God the Son and God the Holy Spirit. So you have three Gods? Father, Son or Holy Spirit? Why did you give three names? Because they aren’t the same. But you just told me there is one God. So which is it? Which name is the name of your God? Yes, but it’s only one. And all three were active in the creation. The beginning of all things. Human beings want to know where we came from. We do genealogy. Adopted children seek out their biological parents. We peer into the heavens, looking back into time, for the beginning of all things – at least, as much as we can understand what that might even mean and assuming there is only one universe. We create theories about the beginning then we refine those theories as our knowledge grows. Genesis has two creation stories. The first one we heard this morning is newer than the second one. The first one was written during the Babylonian exile, some 600 years before Christ. This story is very simple, very succinct. It was written before people new of telescopes or physics. They were trying to make sense of the physical earth, the only object that mattered to them. One thing we know is that ancient peoples did not know is that there was a singularity that exploded, creating our universe. Even though the earth was not immediately created (and for that matter nothing we know existed then either) the stuff that made the earth and every single one of us was created in that one cosmic explosion. Astronomers like to say that we are made up of stardust. Everything we know about ourselves and what’s around us began in that instant. Our building blocks began in that single second. But can we really call it a second when time did not exist before that instant? And technically, time is a human invention. (Just don’t tell Einstein.) Of course, the more Einstein discovered about our universe, the more convinced he was that God began everything. When there is an earthquake or a tornado or a cyclone, we wonder why God would have created such destructive forces. But without those destructive forces, we would not have a habitable planet to live on. When those catastrophic events happen, we need not be helpless. If we cannot directly help victims of natural disasters, we can at least pray for them. In spite of natural disasters, we are blessed to call the earth home. What we have here is an insight into God. God is one. God is universal. God is a God not only of creation, but of all peoples. God creates, sustains, orders, preserves, provides, and loves. The sun doesn’t rise on the United States. It rises on the earth. God blesses all of creation. The early verses in Genesis describe how God created the heavens and the earth. There is an order to that order. For our purposes on this day, what is important is not what was created and when, but how the world came into being. Beginning with the second verse of the Bible, concern about creation is focused on our tiny planet. The rest of the universe is not as important. The ancients believed that before anything existed, the universe was nothing but water. The Greeks called it chaos. When we read the psalms we get a sense of the connection between chaos and uncertainty with water. That is, when water is not seen as the source of life. When the earth was a nothingness, the Holy Spirit hovered, calming, the waters of chaos. Then the Word of God, whom we know as the son, spoke and light came into being – the Big Bang. God named the light and the darkness and the first day of creation was over. “Each part contributes to the whole. God provides for the needs of God’s creatures because God’s specialty is love. However, God did not make this order of creation rigid or mechanical; humans are still called upon humans to subdue it. Rather, God created a flexible, dynamic, and complex world with a mind of its own – again a demonstration of God’s love. What is important here is the way we understand God: as Father, Son, and Holy Spirit – are all active participants in the creation of the universe. One God: Father, Son, and Holy Spirit made the universe. This is the Holy Trinity. Chapter one of Genesis is a poem on the nature of God. It was never intended to be a literal description of how creation took place. Since this was written during the Babylonian exile, it parallels the Babylonian creation myth. To the Jews of Babylon who had lost everything, this story is a story of hope that God is supreme over everything. In spite of the chaos of their lives, God is still creator. This describes a God who doesn’t create over seven days, but is constantly creating. Likewise, we can create order out of chaos as God’s partners. God creates out of love. God loves us. God demonstrates this love in the collaborative way in which the world operates. Genesis 1:1-2:4 recounts the six days of creation nothing is made for itself alone. Everything contributes to the whole of creation. The first three days God creates habitat: structure and light, sky and water, land and plants. The next three days God creates the inhabitants to fill the habitat, which symmetrically correspond to the first three days: the light bearers, the birds and the sea creatures, and finally land animals and humans. We know very little about God. 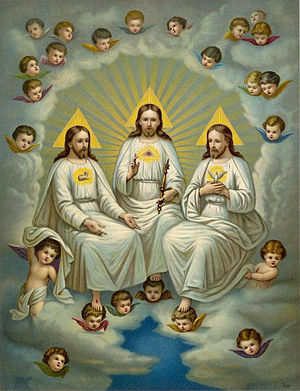 The best we can come up with is the Trinity. The Trinity explains all we can possibly think about God, except for one thing. God is love and we are the object of God’s love. This entry was posted in Church and tagged creation, God, God the Father, God's love, Holy Spirit, Holy Trinity, Jesus, Son of God, Trinity. Bookmark the permalink.